Sorry for the absence from the blog world, I guess nothing really inspired me enough to talk about. What is it you ask that has changed that situation ... well it is a band originally from Dayton, Tennessee, now based in Nashville called 'Taxicab Racers'. I heard their amazing song 'Angel Eyes' (listen below) on a television show and was instantly hooked. The song comes from their debut album 'Hunter/Beggar' (produced by Chad Howat of Paper Route) that is available on iTunes and Bandcamp. 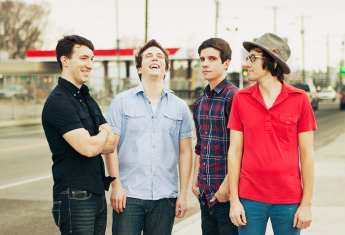 It is hard to believe that this four piece band consisting of Michael Roddy (vocals/synths), Nate Zensen (guitar), Josh Dillard (drums/percussion) and Adam Newport (bass) are still unsigned.